The concept for this residential extension took cues from the original garage and the various ways it was used by the clients and their young children. The old double garage was north facing and could be opened at both ends to connect the rear lane way to the back yard, so it was well utilised for play and gatherings. 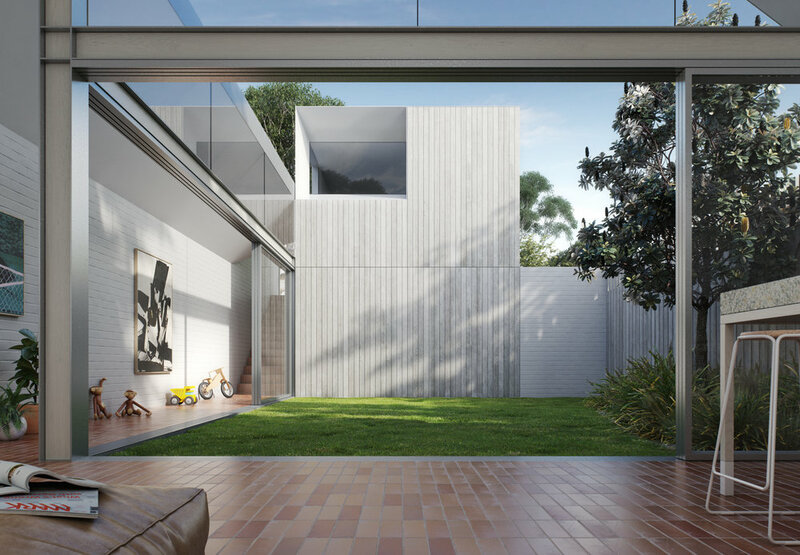 The design of the new extension riffs on the notion of the laneway as an extension of the back yard, an area that was already as much of a bike track or a cricket pitch for kids as it was a place for cars. The orientation of the site meant that an upper level master bedroom was better located off the rear lane in order to avoid overshadowing the back yard. The new living space was sited directly behind the original cottage, contained within a gabled roof to capture natural light and maximise internal volume. The roof linking the garage to the living area peels off the main gable structure, forming a gallery space that opens to become a sheltered part of the yard. In homage to the original garage, the new garage also opens at both ends, transforming the ground plane and laneway into one continuous surface. 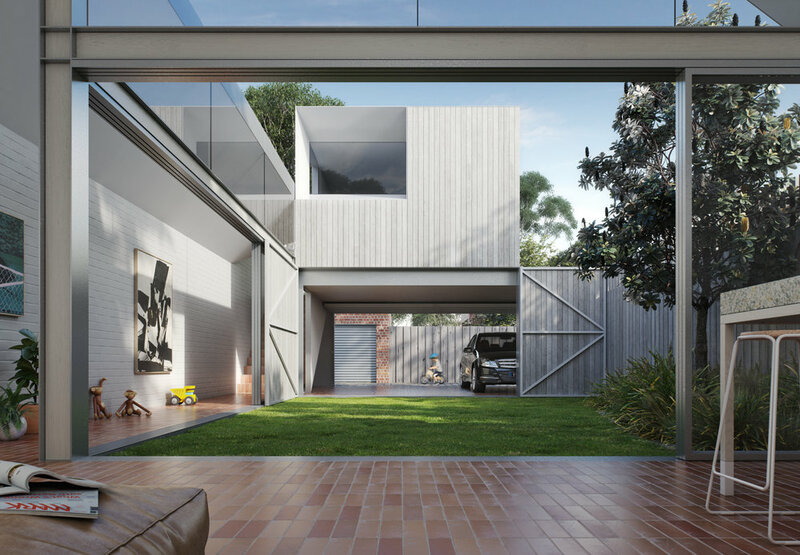 The timber façade of the garage and master bedroom forms the main outlook from the living space, so its presentation was an important consideration. Its composition was conceived as a “mini-tower", a singular building form flanked by a glazed "link" and a low brick wall. The gabled ceiling within the main living space references the roof of the original cottage, visible through a north facing highlight window. Brick paving and terrazzo are a playful tip of the hat to the material eclecticism found in bygone eras of suburban renovations, evoking a heightened sense of place and textural warmth. An opening in the kitchen joinery is expressed as a steel portal through to the original house, the primary intervention here being the insertion of a new bathroom into a once over-sized front room. An open dialogue with the local planning authority optimised the amount of program and boundary wall permitted on this slender site. Alternative layouts which conformed to the planning scheme (but resulted in a loss of amenity) were instrumental in demonstrating the benefits of the preferred design, prior to lodging a formal application. Including the planners in the design process allowed us to achieve key dispensations within the planning permit and a more desirable built outcome for everybody. This proposal responds to an understanding of the family culture embedded within the site and demonstrates ways we can enrich the typical inner-city cottage through considered, passive solutions for residential regeneration.